With a ductless mini-split AC system, you can heat and cool your home effectively and affordably. You’ll enjoy fast and easy installation, lower utility bills, and exceptional reliability. Ductless AC units and heat pumps are ultra-quiet, and one outdoor unit can heat and cool multiple zones. You won’t have to fight over the thermostat anymore, and you’ll enjoy many other benefits. Ductless split systems, also called mini-splits, have two main components. The outdoor unit has a fan, compressor, and intelligent communicating controls. The low-profile air handler is mounted on a wall or ceiling in your home. The outdoor unit and indoor air handler are connected by electrical wires and a refrigerant line that runs through an exterior wall. One outdoor unit can support multiple air handlers in zones totaling 1,400 square feet, so you have the freedom to heat and cool one room or your entire house. Mini-split systems are efficient and easy to install because ducts aren’t required. Basic models meet current efficiency ratings with a Seasonal Energy Efficiency Ratio (SEER) of 15 in cooling mode and a Heating Seasonal Performance Factor (HSPF) of 8.5 when heating. Ultra-efficient ductless mini-split systems that exceed Energy Star efficiency requirements have cooling and heating ratings as high as 18 and 12.5 respectively. Ductless heat pumps and air conditioners are eligible for tax credits up to 10 percent of the total cost, including installation. Utility rebates are also available. Ductless mini-split systems are ideal for unconditioned spaces and additions, but they can also be used to supplement central HVAC in primary living spaces. We have installed mini-splits in sunrooms, garages, bedrooms, living rooms and new constructions. They are an attractive and cost-effective option for areas that need a little extra cooling without the need to upgrade an existing central air conditioning system or install new ductwork. 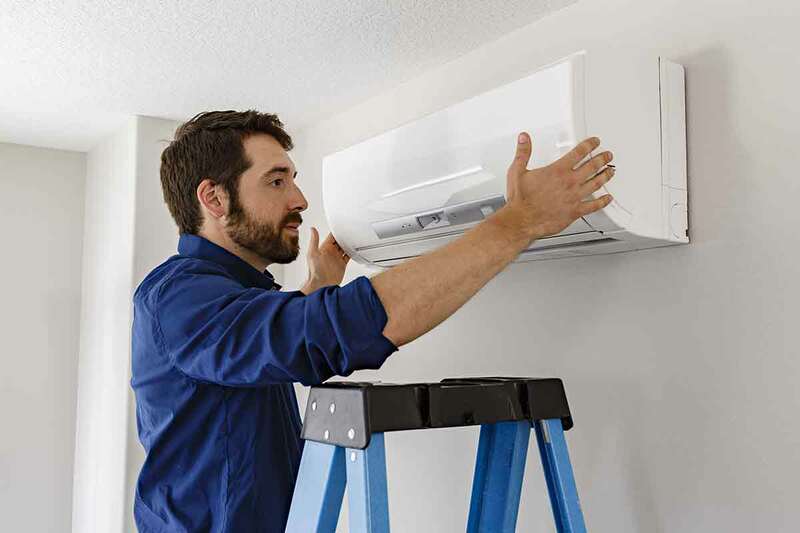 Ductless HVAC systems have a host of user-friendly features, including integrated filtration systems, remote controls, and variable-speed fans. Variable operating speeds reduce energy use and noise. Because there are no ducts, installation is fast, easy, and less invasive. Mini-split AC systems are generally more efficient than traditional HVAC models since air cannot escape through leaky ducts. Plus, you won’t have to worry about allergens and irritants that are commonly distributed via air ducts. To learn more about the benefits of going ductless, or to request a free in-house estimate, call AC State Air at 210-653-5900. We will be happy to answer your questions or schedule an appointment at your convenience.